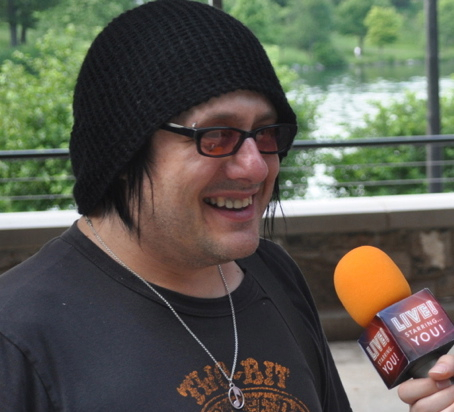 Goo Goo Dolls’ Robby Takac: “I never felt like such a jerk!” – Live! Starring ... You! Here’s a funny thing about being famous: Millions of people who aren’t famous wish they could be. And many of the select few who are famous sometimes wish they weren’t. To people on the outside of fame, the glitz and glamour and power to make people happy seem alluring. Who wouldn’t find it thrilling to rock an arena jammed with screaming fans? But to people who are in the spotlight, the daily rigors of travel, rehearsal, interviews – all on an extreme lack of sleep – sometimes obscure the excitement. The thought hit Robby hard. Do I have to do this again? He couldn’t believe he was questioning it. Before the Goo Goo Dolls became international rock stars, they drove around in a van for 10 years, playing anywhere they could and barely scraping by. Robby was exhausted from a long, grueling tour. But he settled that inner argument by stepping onstage and doing his thing: rocking out.